Zachary is one of HAR's all-star student of Host Agency Reviews 7-Day Setup—he literally entered the industry mere weeks ago. He hasn't wasted a single second, setting up his agency, Zetting Travel. Zachary shares his story and offers insights on how he completed the Setup, created an awesome website, and has already made his booking in one month (no, this is not an typo). He shares wisdom on how he chose a host agency, what he considered in developing his brand and creating his site, and how he's attempting to achieve a work-life balance (spoiler alert, Zachary has three jobs). There's tons more too. As a new agent, Zachary's energy and drive is infectious and will inspire travel agents of every experience level! The HAR 7-day Setup: Our free program for agents looking for some help starting their travel agency. TSheets: The time-tracking tool Zachary uses to help manage his time. SquareSpace: Website program Zachary used to create his agency website. Warm Fuzzy: Jason Carr's ALS Go Fund Me page: Every little bit helps! Please consider a $5-10 donation. 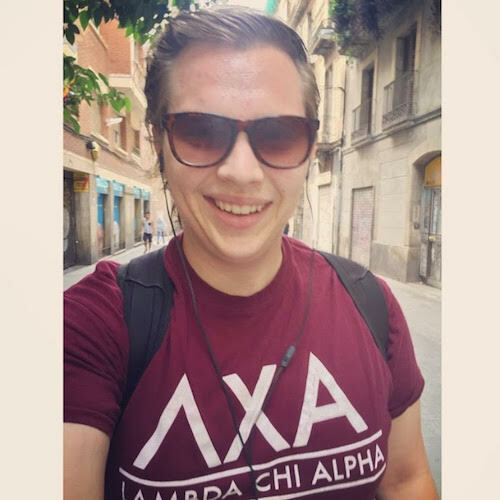 Steph: All right, hey there, Travel Agent Chatter and HAR fans, this is Steph Lee and man do we have a great interview for you today with Zachary Russell, he's the 24-year-old founder of Zetting travel based in Missouri. I'm not sure how many of you know, but in January HAR launched our 7-day set up and we've had over 770 agents take the challenge so far to help get their new agencies set up, and I thought it would be fun for this next episode of Travel Agent Chatter to talk with one of the agents that took the challenge, and they could share their successes and heartaches as they got into the travel industry. 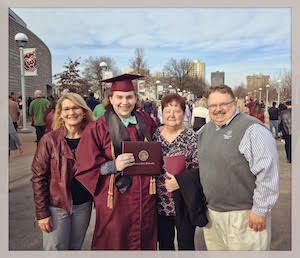 Zachary's always been a great student: Pictured at his Missouri State graduation with his parents and grandmother. Zach was an all-star student for this, we were just amazed at how he had done and how quickly, so it was easy to reach out to him. [00:01:00] Just to note, that I don't want you guys to be stressed about finding links or any other resources we might discuss during the podcast, so don't jot down any notes or anything, we'll be listing all the resources we chat on and as well as the transcript in the show notes. And where are the show notes you're asking? You can find them here at hostagencyreviews.com/ travelagentchatter and then just click on episode two. So, just relax for the next 30 minutes or so and pretend you're out to coffee with Zachary and I talking about all things travel agent. We'll be breaking down the podcast into three segments that we'll break apart. The first will be getting started and how that all went for Zachary, and then the growth of the agency and what he's kind of aiming for, and then we'll end it with some challenges that he came across and things that he's learned. Then we'll end with a bonus warm fuzzy because I love warm fuzzies. So, Zachary, welcome to Travel Agent Chatter! Zachary: Thank you, it's good to be here. Steph: [00:02:00] Yeah, we're super excited to have you. Like I said, you were like an all-star student, I got an email from Zachary saying... The way the challenge works is every day you get an e-mail that gives you action items to do to get your agency started and resources, and we get a note from Zachary that's like, "Hi, could I get some of these ahead of time? I'm already on like day four and I want to be on day seven." We were like we have to chat with this guy, who is he, and he was really great, like getting all his marketing up right away. You know, this isn't your full-time job, you have another full-time job, can you tell us a little bit about your background before you jumped into travel? 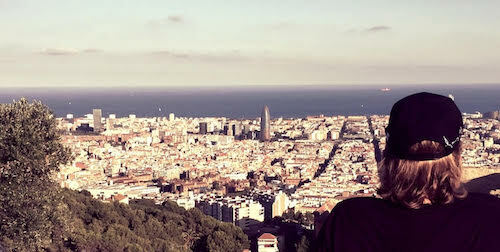 Zachary on a return visit to Barcelona, thinking about his future travel agency. Zachary: I do, yeah. So, I have two degrees from Missouri State University, one of them is a Spanish degree so currently I work at a high school with international students who have moved to where I live and need to learn English. I help them [00:03:00] acculturate and start the process of learning English. As a kid, I was able to travel pretty decently, in college I studied abroad and been on a handful of vacations over the years. All this multiculturalism and travel have kind of just headed up into the desire to want to pursue more of a career path in travel. Steph: So, you ended up ended up with the name Zetting travel which is super catchy and I just love. How did you come up with that? Steph: I love what you've done with it, your Facebook page, I saw your newsletter signup, what is it? What are they called, Zetting Zubscribers or something? Zachary: The Zetting Zociety, but the S in society is also a Z.
Steph: Yeah, you've done a great job with branding. Steph: Also, when I looked on your website, you had an interesting angle that you had talked about with the adding interpretation into the services. Do you want to share a little bit about that? Zachary: Sure! The long-term vision is, in addition to being an established travel agency, to be able to tack on the option for either remote or in person translation and interpretation services. If someone wants to take their family to a country with a language they don't speak, let's say Italy for example and they don't speak Italian. Maybe they're not going to be in Rome the whole time where they're going to find English speakers. Maybe it's the countryside where it's going to be harder to find someone who speaks English. [00:05:00] They could have the opportunity to tack on somebody who speaks Italian from within our company to be able to either be 24/7 on call, they can call them or skype them whenever they need to, or to physically bring them along with them for the translator for any sort of detailed things that could happen, any problems at hotels or anything like that. As a Spanish speaker, I'd be able to help in any sort of Spanish-speaking countries, but the large goal would be to have somebody who speaks French, someone who speaks Chinese, someone who speaks German, etc. to be able to really accommodate to a lot of different kinds of palates of travel and destinations. 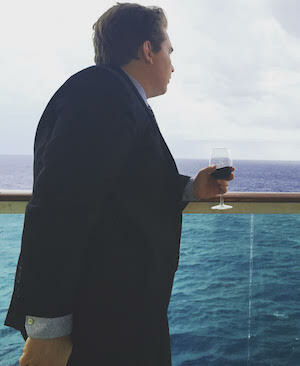 Zachary: I would say it's a specialty of mine, partly because I have been on numerous cruises. Even though I'm only 24 I've been fortunate to be able to see the world via cruise ship in many different times, and so that's my favorite way to travel. Especially if you're kind of new to traveling, because you kind of get to taste everything. You get to taste a couple countries, a couple locations, and maybe in the future you're like, "Ah, I really loved this one place, I could go back there for a longer period of time." So, that's kind of why I focused on cruising, just because I think it's the all-inclusiveness, the ease of transportation and dining and living, and everything is just all there and not to mention you can wake up in multiple different countries over the course of a week. I mean, how incredible is that. Steph: I know, that's pretty crazy, and you're heading out on a cruise soon, aren't you? Zachary: I am, in like a week and a half. Zachary: We are going to Cozumel and Costa Maya, Mexico, Harvest Caye Belize, which is Norwegian Cruise Lines brand-new resort style private island. I'm stoked for that, and then we're going to Roatán in Honduras. Steph: Wonderful, oh I love Roatán, it's so nice. Zachary: I've heard that. Actually, I have students at school from Honduras and they know all about it. Steph: Oh, I stayed there for like a week and I loved it. The snorkeling was great. The only thing that was really bad was the sand flies. Zachary: Oh, yeah, fair enough. Steph: As you were getting started, you ended up choosing to go with a host agency instead of getting your own accreditation. What was appealing to you about what a host agency could offer Zetting Travel versus getting your own accreditation? Zachary: That's a great question. As excited as I am to get into the business, I also know that it takes some time and leverage of [00:08:00] learning the business before you just jump head in. so like a walk before you run sort of idea. So, I knew just from the research that I had done that it was going to be more plausible and probable to join a host agency first, and then over the years of experiences gained and client bases being built that I potentially could maneuver into getting my own accreditation if that happens to be. Steph: So, it's a nice stepping stone of you needed it. Steph: Now, when we had talked about... so the 7-day set up, for most people it takes longer than seven days because there's the research. I think you mentioned that when you were looking for a host agency that was the longest step, it took you like a week and a half or something? Zachary: I think it took me, by the time I just started looking at it to the time I narrowed down my vision, I think it was about a week and a half. [00:09:00] Something like that. Steph: I think for a lot of agents what we hear is that choosing a host agency is one of the most challenging things, and the most stressful. You said something super insightful that I think is helpful to agents struggling with that choice. You had said, "It's not right or wrong, it's about picking one." Which is true, you just have to bite the bullet, there's not going to be like, you really strike out if you've done your research. So, you ended up narrowing things down and ultimately signing up with Travel Quest, how did that end up happening? How did you narrow it down? Zachary: Well, I went down the list on Host Agency Reviews and looked through every single one, did my due diligence. Steph: Of course, you did! 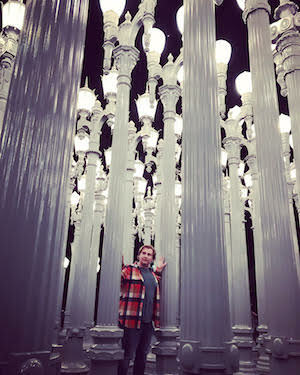 Zachary among towers of light at Los Angeles County Museum of Art. Steph: Are you still there? Steph: Okay, it cut off at the biggest thing that drew you. Zachary: So, the biggest thing that drew me in was the whole family inviting atmosphere, that I felt very welcome, that I felt like this was going to be a group that I could prosper in. Steph: And you had mentioned, too, something that played a big part of your decision was the fact that they were in the same time zone as you. Zachary: Yeah, which, it's funny that it doesn't seem like it's a big deal, but if you're in California for example, if it's 3:00 in California and you're getting off at the end of a job or a meeting or something and you're like, "Oh, I need to ask somebody this, oh wait, my person is in the Eastern time zone and it's way past closing time." Zachary: It really can. So, having my host agency's physical location in the same time zone means I never have to worry about, "Oh, no what time is it there? Did I miss the time?" Just whatever it is now, if there's a question, I know I can shoot an email and I'm probably will get a response before the end of the day. If it's 4:59, I'll know that it's 4:59 and I'll probably get back tomorrow, and that's okay. Steph: Exactly. So, let's move on to talking about the growth of your agency, because Zetting travel has been around for a month roughly now, and have you had your first booking yet? Zachary: I have. I have. It was a Carnival Cruise. Steph: Excellent! So, you have some clients also in the pipeline? Steph: Perfect, because I think an area of some stress for a lot of agents new to the industry is making the first booking and knowing what to do, and not screwing it up. How was making that first booking for you? Stress-wise, and what kind of things did you learn? Zachary: It was kind of stressful, because it's actually doing what I have been planning to do, which sounds ironic, but at the same time it's like, "Okay, this is it, this is what we've trained for. This is not a zero." So, it was kind of incidence like, okay, this is real life, this is real money, these are real things. But at the same time, I felt comfortable in the research I had done prior helped me know this is right, you know, this is the right thing to do, and Travel Quest is really great about just giving the basics. Like, this is what you need to do for our company, [00:14:00] and how you need to tell us what your commission's going to be so we can make sure we pay the right person at the right time, and those things are very easy and simple. That's another thing that post-choosing Travel Quest that I have really appreciated over the month. It's exciting though at the same time, it's kind of a rush, if you will. Like the show? Help spread the word by leaving a review: iTunes, Stitchr, or Google Play. Steph: Yeah! It's one more notch in your belt. It's awesome. So how are you marketing Zetting travel right now? Zachary: Right now, the most heavily, I've tended to focus more on Instagram and Facebook, Twitter I still use, it's just not quite conducive for marketing right out of the gate. It's great further down the line when I've got maybe more clients or followers, if you will. But on Instagram and Facebook I'm able to, whenever I post on there, if it's here's a special today [00:15:00] or here is a really awesome experience or a really cool place you should go to, I can re-share those exact same posts on my personal Facebook and Twitter and Instagram. That has actually proven more beneficial than me just posting on my business, because right now I've got a lot of followers of vendors or maybe like other travel bloggers and stuff like that, which don't get me wrong, is great. But they're not clients. So, having to be able to share on my own personal account is a huge help, because I'm just putting it in front of actual people, and we talk consumers, if you will. That has actually proven quite beneficial, I don't know how many friends just mentioned to me, "Okay, I give, like what is this Zetting thing you keep posting about? I'm interested, you got me." I've lost track of how many times I've had to explain what it is or what I'm doing. From that, I've gotten a couple of these friends that are [00:16:00] newlyweds, and they were like, "We were looking to do a one-year anniversary trip, we'll keep you in mind if something." Just those small things like that kind of build over time. Steph: So, you also have a website that you had set up. How did you, because that's another area of stress for new agents is getting their website set up. There's third party options you can use, you can build your own, and you chose to build your own. Why did you go that route and what did you use? Zachary: Well, to preface, I consider myself pretty tech savvy, maybe not necessarily in the programming sense, but on the consumer level I'm pretty savvy with most everything that's needed, nine times out of ten. Just to preface. Steph: That was a good preface. Zachary: Thank you. I feel like it's important information to keep in mind because not everyone is that way and that's okay. So, I end up picking Squarespace for my website. I had a [00:17:00] free account for a year or so that just wasn't really being used, and so I decided I need to use this website, hey, look, I can actually start pursuing this travel agency, which is kind of I think what really got the ball rolling. This is as I know for new agents, strongly suggest Squarespace for the most basic reason. They have the template and it's really simple to build, but also it looks really good. The quality is very professional, which for marketing especially on the internet is the most important thing. If your website looks good, you look put together, you look more professional and official. It doesn't matter how new or how old you are. The better your website looks, the better your presence on social media is and whatnot is, the better you will look which in the end will provide better and more clients. So, that was kind of the reason that I stuck with them. [00:18:00] And so just deciding to build that, I used Google Suite technically for my domain user name, the www. @zettingtravel.com or any and then my email address is @zettingtravel.com. Highly recommend that too, because you can directly connect your G Suite account to Squarespace which is kind of like a connection of companies there. It's just really simple. For any new agents that are trying to figure out what software to use and stuff, G Suite and Squarespace, just going to put that out there. It will make your life easier. Steph: Thank you, we'll put a link in the show notes and we use G Suite as well and really recommend it for transferring the domain names so you can have a customized domain email instead of like stephtravel@gmail.com. Zachary: Right. It's just a little extra bit that makes you it seem even more professional and put together. [00:19:00] Yup, exactly. Steph: Well, yeah, thanks for those tips. What kind of, like, as you're seeing your agency grow slowly, what kind of goals do you have for the future? Zachary: I want to be able to consistently book. I think like that's a solid goal to have. Part of that is building the stamina and the ability to be working with the clients that I currently have while also trying to gain new clients, and finding the balance of doing that and not getting burned out eventually. Not doing so much time on X amount of clients I'm working with right now, but as soon as they're gone I'm gonna need more, but I'm going to have to put time in in order to get those clients in the future and that can get exhausting. I would like to see as the more as I grow the more as I set to launch my niche balance and how I can equalize my time, so that I'm [00:20:00] still making bookings, but at the same time still prepping for future bookings. That's kind of a hard thing to find. It's really not an exact science, it's different for each person, each business. Steph: Yeah and each client is going to take different amounts of time, so it's something that's hard to predict. Let's move into kind of the challenges that you've run across as you're getting your agency started. For most people when they join the travel industry, I always let people know it takes a good three to five years probably to have a solid client base because the turnaround time, people are only booking one to two trips a year, so by the time you get referrals from them and repeat clients, it's already a year or two. Then you take into account that commissions don't come in until usually the client has traveled or put on their final payment which means if they're booking [00:21:00] eight months out, you're not seeing that money. So not a lot of people can afford to go full time into the travel business with that big lack of income. So, for you, you have your full-time job and then you have a part-time job on the side, because why not, and now you have your travel job. I think you had some great insights as well into how you balance your full-time job with your agency job. Do you want to share those? Zachary: Yeah, so, to start off, again the preface. I did a really bad job at this in the first couple of weeks, but I spent way too much time on trying to build the travel agency up and not enough time balancing everything else out. That being said, that's kind of my personality. And so, now that it's been a month I can retrospectively look back with that, "Okay, that's a little much." So now I've got to formulate how my time works, what's the best way to function, [00:22:00] am I going to have actual hours or am I just going to be more monitoring of my time spent on booking or research or talking with clients etc. This is another pro-tip for people. I downloaded an app and have created an account with an organization called TSheets, the letter T and sheet. And it's just a simple time tracker. It can do other things, payroll, etc. if you need to. If you have a larger than one person agency. For one person, it's a free subscription, but I like it because I can just quickly create a section like "Research" for example, pull up my phone and plug in, and do whatever I'm doing. And then if I step away from my phone or something and computer with me, "Oh, no, I forgot to clock out," I can just pull up the website and it's internet cloud based, so it doesn't have to be started and stopped on the same device, which is great for me because I'm kind of up and moving around all the time, sometimes I'm with phone, [00:23:00] I'm like on the table, and I walk half across the room or the house or whatever. So, that's been really helpful just in the last because they're getting a little more structure, especially since I have three jobs now, I have to really structure my time accordingly and then equally like rest. I know it's kind of a crazy idea to rest every once in a while. Zachary: It's crazy, right? So, being able to clock in clock out, making it feel like a legitimate hourly job if you will, and kind of helps me keep track and tabs of how much am I working? Am I working so much that is my commission or my income equalizing with how many hours I'm putting in? If not, what can be do to fix it? I think some of that comes with experience like you were talking about, it takes a handful of years to really get good into the business, to have your solid foundation and whatnot. Upfront it's kind of hard to really see that, [00:24:00] because you're green and you're new. So, I still kind of feel that way, but being able to just physically clock in and clock out, keeping mind of how much time I spend and how much time I spend on individual clients, is really important. Steph: Now, because you have your full-time job where you're not able to respond to some clients right away, do you have hours on your e-mails or how do you let clients know you'll get back to them, but it may not be right away? Zachary: Sure, I don't have specific hours partly because my full-time job is in a set time-frame, my part time job is not, so each week is not exactly the same. It's kind of hard to set exact hours. More recently, I've pretty much gotten into a habit of when I talk to a client or a customer about what trip they're doing or whatever, if I can just feel like this is going to take some research. [00:25:00] This is not something I'm just going to be able to come up within 10 or 15 minutes, it's going to take an hour or two, then I'll probably let them know I will get back to you within this week. You'll hear from me within a week, or by Friday. Giving a deadline to that customer as well as myself, and with that time-frame in mind, then I can look at my schedule as it is that week and be like, "Okay, when is the time that I have that I could work on this." Is it going to be a long, long process where everyone have time to do in three days, am I going to need a week, am I going to need maybe longer? If it's a trip months and months down the road and it can take a little more time to kind of research and plan as opposed to something maybe that's a couple months away. Your type based on that factor, which is definitely key at sometimes. Steph: I agree, yeah. You're still green, but you've gone through the getting your agency set up. [00:26:00] What advice would you give to other agents that are starting up their agencies? Zachary: Do your research exhaustively, which is a lot, it will be a lot of hours. Steph: It doesn't mean you guys need to e-mail me and say I need my 7-day set up in advance. Zachary: Yeah, no one does that. Steph: I know, it's weird. Zachary: I started on like a Friday night, I think so I was fortunate I've had all weekend to just kind of binge, if you will, on research. That doesn't work for everybody. It worked for me. Do your extensive research, do your due diligence, you owe it to yourself when you finally choose a host agent, when you decide your marketing platform, when you decide what kind of things you might specialize in, etc. You need to feel like you know what you're doing, even if you haven't made a booking, [00:27:00] even if you haven't actually done the process yet, the homework pays off. That's the reason people go to school. The reason people go to college and get degrees, so that when they get the job they already know what they're doing, or they have at least an idea. So, do your due diligence. If it takes going through every ninety some odd host agents on hostagentreviews.com, do it, because at the end of the day you can at least say, "Well, I went through 90 host agencies and narrowed down to 10." And then narrowed down to five, and then you narrowed down to one. Zachary: It really is true. It may not be a lot of fun all the time, because you know you're just doing hours and hours of research. But in the end of the day, by the time you actually make your decisions, it will be worth it and you'll feel a lot more comfortable making a big decision like that. Steph: Definitely, it's not easy, there's a lot of work involved and a lot of nitty gritty boring things of reading and preparing, but that's what it takes to get a business set up. Zachary: Exactly. [00:28:00] Any kind of business, not just a travel agency, any kind of business. Zachary walks the streets of Barcelona. Steph: Exactly. Well, we're kind of coming to the close of the show, and so I woke up this morning and decided that I needed to end every episode with a warm fuzzy, this just came to me, or some random act of kindness because I was like, "Everyone needs warm fuzzies and when you're surprised by some random act of kindness in life that's the best ever." So, I just told Zach this before we got on the call, I was like, "By the way, I'm going to end it this way, do you have a warm fuzzy?" So, do you want to share a warm fuzzy that will leave the listeners with a feeling of peace and happiness? Zachary: Yeah, I had to think about it for a second, but I got it. I'm an alumni of Lambda Chi Alpha fraternity at Missouri State and our alumni adviser's nephew has been diagnosed with a severe illness [00:29:00] I believe a cancer of sorts. So, my fraternity has decided to put on a huge WWE-esque event in order to help raise funds for our alumni adviser's nephew, whose name is Grant. So, there's been all kinds of planning, they have a legitimate wrestling ring, they're doing the training, they're gonna put on this show and hope to make this a big event to raise money for this little boy. So, shout out to my chapter at Lambda Chi Missouri State, you guys are awesome, I'm proud of you guys. Steph: I love that, and I'm just gonna piggy back on that too because I have a friend, his name is Jason Carr, he was diagnosed with ALS or Lou Gehrig's disease a few years ago. He's got two young sons and a wife, and he used to be a carpenter and helped me with some projects around the house, but obviously now as he's losing his mobility, he just went into [00:30:00] a fully motorized wheelchair in the past month. They're not able to work and his wife had to leave her job to caretake for him and their sons full time, and so I had posted some things up on social media to try to raise some money for him to help. Medicare didn't pay for their wheelchair. He has a GoFundMe page and we had about $300 in donations which was really exciting and if anyone listening who would like to donate as well to Jason, you can google Jason Carr, and we'll put a link in the show notes as well, and the GoFundMe, and you can find his page. Even a $5 or $10 donation is helpful to let them know that people are thinking about them and their situation, especially as they're more homebound, it's really nice to know that others out there care. [00:31:00] Well, let's see that's about all for Travel Agent Chatter today, you can subscribe to us on iTunes by searching for Travel Agent Chatter, or you can read the transcript and see the show notes on Hostagencyreviews.com/travelagentchatter. We'd love to hear your thoughts on any future shows in the comments, or if you know of an agent or yourself that would be great to interview, drop us a line in the comments, we'd love to hear from you guys. And Zach, thank you so much for being on the show, we can't wait to hear how Zetting Travel explodes. Zachary: Well, thank you so much, it was a pleasure and an honor to be here. Steph grew up in the travel industry. She worked with thousands of agents in her role as a former host agency director before leaving in 2012 to start HAR. She's insatiably curious, loves her pup Rygy, and is -- let's face it -- kinda quirky.